Shortly after Ivan Drucker joined the Juiced.GS staff last fall, he shared with me a concept he was working on: Structured Applesoft. It's a new way of programming in a familiar language that makes the programs easier to develop, read, and edit, all without requiring new software, routines, or patches. 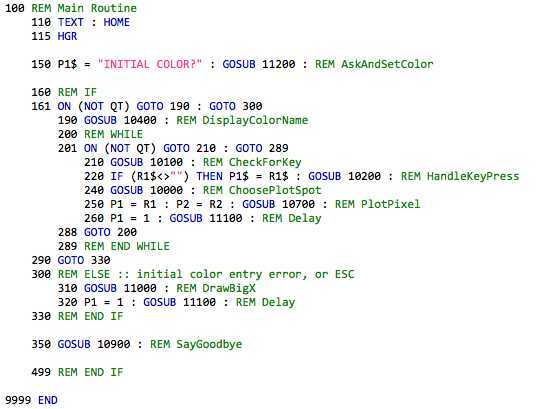 TextWrangler will use Juiced.GS's plist to colorize Structured Applesoft code. Ivan started detailing the concepts of Structured Applesoft in the December 2009 issue and finished in March 2010. The limits of the print edition prevented him from fully outlining all the guidelines he'd devised, though, so we decided to save some of the more esoteric ideas for online, where interested parties could explore them without pushing out more general-interest topics from the print edition. In the process of crafting this final installment, Ivan found an obscure error with some of the code that was printed in this week's issue of Juiced.GS. Though a correction will appear in the June issue, we decided to include this update with the other content that was already intended for our Web site. The correction and two supplements are now available online. You can view the material as a Web page or as a Juiced.GS-style PDF. Ivan has also provided a sample program that demonstrates these Structured Applesoft concepts. Links to these pages have been added to the issue links for Volume 15, Issue 1. We hope you find these files to be useful elaborations on this approach to BASIC programming. Thanks to Ivan for pursuing this topic so thoroughly!